Type I interferons play an outstanding role in innate and adaptive immunity by enhancing functions of dendritic cells, inducing differentiation of monocytes, promoting immunoglobulin class switching in B cells and stimulating effector functions of T cells. The increased production of IFNα/β by plasmacytoid dendritic cells could be responsible for not only efficient antiviral defence, but it also may be a pathological factor in the development of various autoimmune disorders. The first evidence of a genetic link between type I interferons and autoimmune diseases was the observation that elevated IFNα activity is frequently detected in the sera of patients with systemic lupus erythematosus, and that this trait shows high heritability and familial aggregation in their first-degree healthy relatives. To date, a number of genes involved in interferon signalling have been associated with various autoimmune diseases. Patients with systemic lupus erythematosus, Sjögren's syndrome, dermatomyositis, psoriasis, and a fraction of patients with rheumatoid arthritis display a specific expression pattern of interferon-dependent genes in their leukocytes, termed the interferon signature. 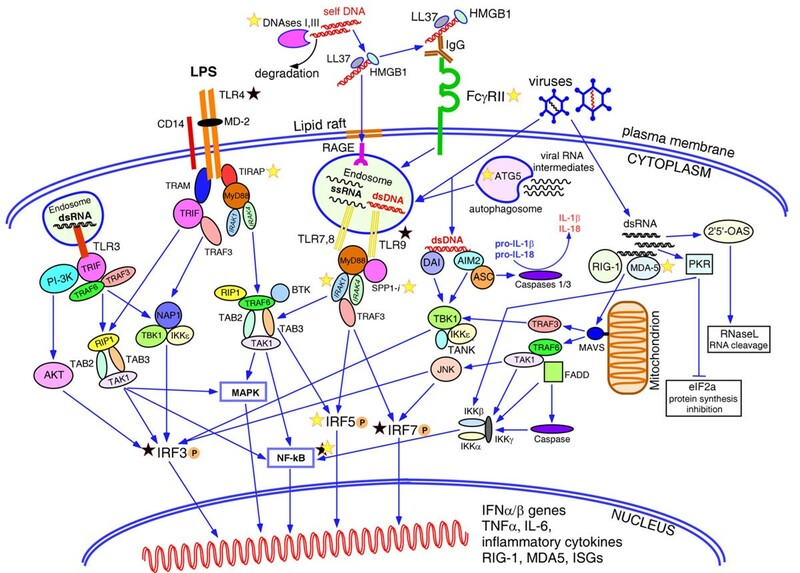 Here, in an attempt to understand the role of type I interferons in the pathogenesis of autoimmunity, we review the recent advances in the genetics of autoimmune diseases focusing on the association of genes involved in type I interferon pathways. Type I interferons comprise a large group of structurally similar cytokines that includes 13 subtypes of IFNα and unique IFNβ, IFNε, IFNκ and IFNω in humans, which exert similar but not identical effects due to their different binding affinities to a common cognate receptor [1, 2]. Genes coding for the type I interferons are clustered on human chromosome 9p22 and apparently originated from a duplication of a single gene . Both the number of genes and their intronless structure point to the vital role of interferons in host defence against viruses. During a viral infection, type I interferons activate innate immune responses and exert anti-proliferative and cytotoxic effects on cells. Type I interferons also induce survival, maturation and activation of different subsets of dendritic cells, thereby enhancing their antigen-presenting abilities. Activated dendritic cells upregulate expression of human leucocyte antigen and other co-stimulatory molecules, such as CD40, CD80, CD83 and CD86 [4–6], and initiate the production of cytokines such as TNFα, IL-6, IL-10, IL-12, IL-15, IL-18, IL-23 [7–10], B-cell activating factor [11, 12], and the chemokines CCL3, CCL4, CCL5, and CXCL10 [13–17], which in turn exert co-stimulatory effects on all other immune cells. Type I interferons link together both innate and adaptive immune systems. Their effects in adaptive immunity are mediated through activated dendritic cells and also by direct binding to interferon receptors on B cells, T cells, neutrophils and natural killer (NK) cells. They promote immunoglobulin class switching and antibody production in B cells, promote T-cell effector activity and promote synthesis of IFNγ by T cells and NK cells, and they protect both B cells and T cells from apoptosis [18–32]. Type I interferons can also promote pathologic autoimmunity; IFNα is able to break self-tolerance by activating antigen-presenting cells after uptake of self material . The first genetic link between type I interferons and autoimmune diseases was provided by the observation of an elevated IFNα level in the sera of patients with systemic lupus erythematosus (SLE), and the familial aggregation of this trait in healthy relatives [34–37]. This observation suggested that the alteration of the interferon pathway is a primary event in SLE pathogenesis, rather than a consequence of the disease phenotype. The levels of IFNα activity in patients with SLE are positively correlated with both clinical and serological markers of disease activity [34, 35, 37, 38]. Increased levels of IFNα were also observed in patients with rheumatoid arthritis (RA), scleroderma and primary Sjogren's syndrome (pSS) . Moreover, about 20% of patients with long-term treatment of haematological malignancies and viral hepatitis infections with recombinant IFNα develop lupus or other autoimmune diseases, such as type 1 diabetes, psoriasis, inflammatory arthritis and pSS, or show symptoms resembling autoimmune diseases [39, 40]. These results together further substantiate the involvement of IFNα in the development of various autoimmune disorders. SLE patients display another important feature of an active interferon-mediated signalling: an overexpression of genes regulated by type I interferon, termed the interferon signature, which is more prominent in patients with severe disease . In agreement with the idea of a shared genetic basis of autoimmune diseases , the interferon signature has also been demonstrated for pSS, dermatomyositis, psoriasis and some RA patients . In the present review we will give a brief overview of the type I interferon signalling, with the main focus on the genetic linkage between type I interferon-mediated pathways and autoimmune diseases. True functional variants for the majority of associated genes have not yet been found, and for that reason the biology behind them is largely unknown. Owing to the space constraints, we shall examine in detail only a few genes with either strong or consistent evidence of association with autoimmune diseases for which functional variants have been described or, at least, proposed. A more complete list of associated genes involved in interferon-related pathways is presented in Table 1. E627X and I923V are loss of function mutations. V89M, K5X, 46_72 deletion, rs179982-rs1030874-rs1059857 haplotype,. Alleles associated with increased risk to develop the disease are underlined (alleles over-represented in patients). SLE, systemic lupus erythematosus; PAPS, primary anti-phospholipid syndrome; T1D, type 1 diabetes; RA, rheumatoid arthritis; MS, multiple sclerosis; GD, Graves' disease; IBD, inflammatory bowel disease; pSS, primary Sjögren's syndrome; mPA, microscopic polyangiitis; WG, Wegener's granulomatosis; AITD, autoimmune thyroid diseases; JIA, juvenile idiopathic arthritis; GCA, giantcell arteritis; UC, ulcerative colitis; CD, Crohn's disease. Although all nucleated cells can produce type I interferons in response to viral infections, there is a group of professional cells producing extremely high amounts: the plasmacytoid dendritic cells (pDCs) [44, 45]. The bulk yield of interferons may reach 3 to 10 pg/cell, which is estimated to be about 1,000 times more than in cells of any other type. The ability of cells to sense infections is linked to the special sensors localized on the membrane and in the cytosol (Figure 1). The first group consists of the Toll-like receptors (TLRs), of which TLR3, TLR4, TLR7/8 and TLR9 transmit the signal resulting in the induction of interferon genes after ligation with dsRNA, bacterial lipopolysaccharides, single-stranded RNA and unmethylated CpG-rich DNA, respectively . Unlike cells of other types, pDCs express only TLR7 and TLR9, giving these two receptors a paramount importance in type I interferon production [47–51]. Another group of ubiquitous sensors, the RNA helicases retinoic acid-inducible gene 1 and melanoma differentiation-associated gene 5, reside in the cytoplasm and recognize dsRNA and viral replicating intermediates [52, 53]. The presence of viral RNA in the cytoplasm may activate the ultimate weapons of the antiviral defence - dsRNA-dependent serine-threonine kinase  and 2',5'-oligoadenylate synthetase  - resulting in complete stalling of the cellular transcription and translation in the infected cell and, eventually, apoptosis. It was shown recently that cytoplasmic dsDNA could be recognized by two cytosolic dsDNA sensors: DNA-dependent activator of interferon regulatory factors (IRFs), and absent in melanoma 2 - both signal through TBK1 and IRF3, and induce genes for IFNβ and proinflammatory cytokines . The binding of absent in melanoma 2 to dsDNA leads to activation of caspase 1 and caspase 3, which cleaves and releases IL-1β and IL-18 [57–61]. Pathways leading to the type I interferon production. Among the family of Toll-like receptors (TLRs), TLR3, TLR4, TLR7/8 and TLR9 are known to induce production of type I interferons in various cells. Surface TLR4 recognizes lipopolysaccharides (LPS) from bacterial cell walls and trasmit the signal downstream via MyD88-dependent or MyD88-independent pathways resulting in phosphorylation, dimerization and nuclear translocation of IRF5 and IRF3, and activation of NF-κB and mitogen-activated protein kinase (MAPK) pathways. Intracellular TLR3, TLR7/8 and TLR9 residing in the endosomes are activated by viral double-stranded (ds)RNA, single-stranded RNA and unmethylated dsDNA, respectively. TLR3 signals via adaptor TRIF and activates IRF3, NF-κB and MAPK pathways. TLR7/8 and TLR9 transmit the signal via the adaptor molecule MyD88. The intracellular form of osteopontin 1 (SPP1) binds to MyD88 upon ligation of TLR9 with unmethylated CpG oligonucleotides and promotes induction of IFNα genes in mouse plasmacytoid dendritic cells (pDCs). TLR7 and TLR9 are the only receptors expressed in pDCs, while other cells contain other TLRs as well. Detection of nucleic acids by TLRs in intracellular endosomes prevents immune responses to the host self-DNA. Normally, nucleic acids released by dying necrotic or apoptotic cells undergoing rapid degradation by nucleases, DNaseI and DNaseIII (TREX1), while bacterial or viral nucleic acids are protected by the cell wall or viral capsid and could be detected by TLRs only after penetrating the cell. Breach of tolerance to self-DNA and activation of pDCs could happen if self-DNA remains undegraded due to defective function of the nucleases and meet endosomal TLR9. Cationic antimicrobial peptide LL37 and high-mobility group box 1 protein (HMGB1) released by damaged or infected cells, mainly keratinocytes and neutrophils, bind DNA making it resistant to degradation and facilitate endocytosis of DNA through the lipid rafts and receptor for advanced glycation end-products (RAGE), delivering it to TLR9. DNA/DNA-protein aggregates could be recognized by anti-DNA/anti-RNA-binding proteins (anti-RNP) antibodies produced by the autoreactive B cells. Binding of these immune complexes to the low-affinity Fcγ receptors II leads to their internalization and translocation to the endosomes containing TLR9. Viral DNAs residing in the cytoplasm could be detected by two cytoplasmic DNA sensors, DNA-dependent activator of interferon regulatory factors (DAI) and absent in melanoma 2 (AIM2), which trigger induction of type I interferon genes through TBK1-mediated and IRF3-mediated signalling. AIM2 also activates caspases 1 and 3 by recruiting adaptor ASC (apoptosis-associated speck-like protein containing a CARD) and forming an inflammasome that promotes release of IL-1β and IL-18. Two RNA helicases, retinoic acid-inducible gene 1 (RIG-1) and melanoma differentiation-associated gene 5 (MDA-5), detect viral RNAs in the cytoplasm. Activated RIG-1 and MDA-5 interact with adaptor protein MAVS anchored by its C-terminal domain to a mitochondrion. This interaction triggers signalling through TRAF3 and TRAF6 adaptors and results in activation of IRF3, IRF7 and NF-κB pathway. Autophagosomes can engulf the replicating viral RNAs and, after fusion with endosomes, present it to the TLR7/8. Viral RNAs can induce a common antiviral defence mechanism aimed at blocking viral replication through total inhibition of cellular transcription and translation. Thus, dsRNAs activate 2',5'-oligoadenylate synthase (OAS) producing 2',5'-oligoadenylates, which in turn activate the latent nuclease RNase L, resulting in the degradation of all cytoplasmic RNAs. Another pathway targets protein synthesis machinery by protein kinase dsRNA-dependent serine-threonine kinase (PKR), which inactivates the alpha subunit of initiation factor eIF2, resulting in rapid inhibition of protein translation. The latter two pathways may induce apoptosis of the infected cell. Yellow stars, genes with strong evidence for association with autoimmune diseases; black stars, genes with inconsistent association. ISG, interferon stimulated genes; PI3K, phosphoinositide 3-kinase. Interestingly, autophagy - an autonomous process of re-utilization of cellular organelles - has been also implicated in the induction of innate immune responses and production of type I interferons . Viral RNA could be engulfed by a forming autophagosome and, after fusing it with an endosome, could be detected by TLR7. Mouse pDCs lacking the autophagy-related 5 (yeast) (Atg5) gene showed a decreased IFNα response and were unable to respond to vesicular stomatitis virus infection . It is important to note that the activation of a particular pathway depends upon the cell type, the nature of the pathogen and the cytokines present in the milieu. All of these factors determine the pattern of induced genes, which could vary from the induction of IFNα/β genes in pDCs in response to certain viral infections to the induction of genes for other proinflammatory cytokines in another cell type. IRF5 belongs to the family of IRFs and plays an essential role in many aspects of cellular responses to interferons, including antiviral defence, cell growth regulation and apoptosis [63–67]. The IRF5 gene was associated first with SLE [68, 69], and since then its association has been established with many other autoimmune diseases, including RA , Sjögren's syndrome , inflammatory bowel disease , and multiple sclerosis . The genetics of IRF5 is very well studied to date, and finds support in the functional analysis of the associated causative variants. Several functional polymorphisms are believed to play a major role in determining the gene function in the pathogenesis, including: the promoter CGGGG insertion/deletion, which strengthens the binding site for the Sp1 transcription factor and thus affects the expression of the gene ; the SNP rs2004640, which creates an alternative 5'-donor splice site leading to the splicing of the alternative 5'-UTR exon 1B; the in-frame insertion/deletion of the repetitive sequence in exon 6, which makes two families of the alternative IRF5 transcripts  (the exon 6 insertion/deletion is located in the putative PEST domain of the protein, but its function at present remains unknown); and, finally, the SNP rs10954213, which alters the polyadenylation signal. The presence of the G allele results in a longer 3'-UTR with two AU-rich elements rendering the transcript for rapid degradation, while the A allele generates mRNA with a short and stable 3'-UTR . It has been shown that only the promoter insertion/deletion and the poly(A) SNP alter the gene expression levels . The level of the alternative transcripts caused by the T allele of rs2004640 is very low, and it encodes for essentially the same protein isoforms as the transcripts with the major exon 1A. A high-risk IRF5 haplotype has been defined and is predicted to give rise to transcripts expressing exon 1B isoforms (rs2004640-T), to carry the exon 6 insertion, and to be overexpressed because of the poly(A) variant (rs10954213-A) . The fourth variant is rs20710197(C), or its proxy rs10488631, and is an excellent predictor or tag of the risk haplotype in Caucasians and Hispanics [68, 77–80]. Niewold and colleagues demonstrated that this well-defined SLE risk haplotype is associated with higher serum IFNα activity in patients with SLE . Moreover, the differential effect of the IRF5 genotype on serum IFNα activity is more pronounced in SLE patients positive for either anti-RNA-binding proteins (anti-RNP) or anti-dsDNA autoantibodies . This effect suggests the possibility of a tight link between autoantibodies and IRF5; that is, autoantibodies containing residual nucleic acids may enhance TLR-mediated signalling in individuals with a given risk genotype, and hence high expression of IRF5, and may predispose them to a greater production of IFNα. 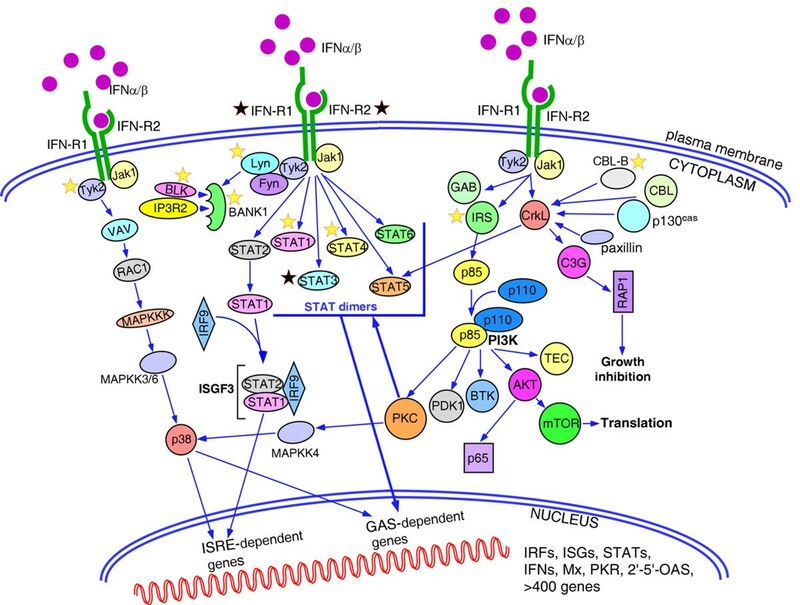 The strong genetic link of IRF5 with various autoimmune diseases across many populations may be due to the place IRF5 has in the signalling cascades. It lies downstream in the signalling path of many different receptors (TLR4, TLR7/8, TLR9), and thus can respond to diverse pathogens [81–83]. Furthermore, the gene is expressed in pDCs, monocytes and B cells, and its enhanced function may cause overexpression of IFNα/β and the proinflammatory cytokines TNFα, IL-6 and IL-12 in these cells . Many other genes, including the transcription factors signal transducer and activator of transcription (STAT) 1 and STAT3, which mediate the interferon-signal ling pathway, are also regulated by IRF5. Overexpression of IRF5 may lead to accelerated apoptosis, contributing to the increased burden on the immune clearance system [65, 75]. The enhanced function of the IRF5 gene caused by the high-risk allelic variants may therefore lead to systemic effects of the immune system. In this regard it is interesting to mention that the frequency of the IRF5 risk haplotype among healthy Mexicans is higher compared with that among Europeans (20% vs. 9%) and is even higher in Mazateco Mexican Indians (31%) . As for the lupus patients, the difference is even more striking - with 20% of the homozygous haplotype in Mexican SLE patients as compared with 3.3% in European SLE patients. It is tempting to speculate that this phenomenon originated from the positive selective pressure on Mexican Indians carrying risk alleles, and hence high expression of IRF5 and interferons, which gave them survival advantages against certain viral infections brought from the Old World. At the same time, the side effect of this survival might be leading to a more severe SLE in Mexican patients, characterized by the earlier onset and frequent renal and other organ damage . Remarkably, neither IRF3 nor IRF7 seem to be reliably associated with autoimmunity. Although a SNP (rs4963128) in PHRF1 (previously known as KIAA1542) has been convincingly associated with SLE [85, 86], and this association is believed to be due to linkage disequilibrium (LD) with IRF7, no study has yet directly tested IRF7. The PHRF1 and IRF7 genes are localized on chromosome 11p15 in a tail-to-tail mode. The haplotype structure of the HapMap-CEU population (data Release 27)  shows that both loci are located within the same haplotype block together with the mucin-like protocadherin MUPCDH. The associated PHRF1 variant is 23 kb downstream of IRF7 and is in rather moderate LD with two SNPs in IRF7: rs12805435 (r2 = 0.475) and rs10902178 (r2 = 0.475). Thus, even though IRF7 is the most plausible candidate in this region given its function in IFNα production, its role as a susceptibility gene for SLE remains to be verified. A promoter polymorphism in the IRF3 gene conferring higher expression of IRF3 was associated with SLE in one Japanese study ; however, the association was not corroborated on a larger set of Spanish patients . Of note, IRF3 is constitutively expressed at high levels in all cells, while low levels of IRF7 are present in cells of lymphoid origin. This contrasts to an even more restricted pattern of expression of the IRF5 gene, as mentioned above. The SNP rs17445836 located 61 kb downstream of the IRF8 gene has been recently associated with multiple sclerosis . Although the authors concluded that the most likely susceptibility gene was IRF8, the block where the SNP is located is separated from IRF8 by three recombination hot spots . Interestingly, the presence of the risk allele G of rs17445836 was positively correlated with expression levels of the IRF7 and IFIH1 genes, but not with IRF8 itself or interferon genes. The transcription factor NF-κB is a central regulator of immune responses and inflammation, and is present virtually in all cell types. It is composed of homodimers or heterodimers formed by the members of the NF-κB family, which include RelA (p65), RelB, c-Rel, NF-κB1 (p50) and NF-κB2 (p52) . Single and double knockout mouse models for these genes display survival and phenotypic differences, suggesting that, despite some overlapping functions, they all have unique roles in the immune system (reviewed in ). Recently, the gene coding for c-Rel (REL) was identified as a susceptibility locus for RA . c-Rel expression is restricted to haematopoietic cells and lymphocytes, and mainly to T cells and B cells. In contrast, RelA, NF-κB1 and NF-κB2 are widely expressed in various cell types and constitute the major classic NF-κB factor, residing in its inactive form in the cytoplasm. Stimulation of cells activates NF-κB, which translocates into the nucleus and induces the expression of a great number of genes. Interestingly, constitutively active nuclear heterodimer p50/c-Rel is found in mature B cells also co-expressing the cytoplasmic heterodimer p50/p65, suggesting a specific function for c-Rel in B-cell stimulation . Mice deficient for c-Rel develop normally and display only unresponsiveness of B cells and T cells to certain mitogenic stimuli . B cells lacking c-Rel show increased sensitivity to B-cell receptor-mediated apoptotic signals . c-Rel is indispensable for expression of IL-12 and IL-23 subunits in mouse dendritic cells [97, 98]. With exception for one more member of the family, NF-κB1 - which has been inconsistently associated with genetic susceptibility to some of the autoimmune diseases [99–101] - no other factors were found to be linked with autoimmunity. Remarkably, NF-κB1 knockout mice - unlike knockout mice for RelA, RelB, or NF-κB2 - have only minor defects in lymphocyte activation, and particularly in B-cell responses . SLE patients display an increased rate of apoptosis of peripheral mononuclear cells and decreased clearance of the circulating immune complexes (ICs), which together may lead to the accumulation of high titres of ICs and cause organ damage [103, 104]. The Fc gamma receptors (FcγR) are low-affinity receptors for the Fc portion of IgG and play a critical role in the clearance of ICs. Several polymorphisms for FcγRIIa, FcγRIIb, FcγRIIIa and FcγRIIIb genes located in a tight cluster on chromosome 1q23 have been associated with SLE, lupus nephritis and primary anti-phospholipid syndrome [85, 105–107]. The most consistent association, replicated in various populations of diverse ethnic groups, is the missense variation of FCGR2A (Arg131His) located in the ligand binding domain of the receptor . Arginine coded by the susceptibility allele significantly reduces the affinity of binding to circulating IgG2. This, in turn, results in impaired FcγR-mediated phagocytosis and poor clearance of ICs. Receptor ligation leads to the activation and maturation of dendritic cells and enhances their ability to stimulate T cells via cross-presentation of antigens and enhanced secretion of inflammatory cytokines. Interestingly, pDCs express FcγRIIa containing the activation ITAM domain, but not FcγRIIb with the inhibitory ITIM domain . It was shown also that ligation of FcγRIIa triggers IFNα production by pDCs . In this regard, it is unclear how to reconcile the stimulatory function of the receptor on the interferon genes and the association with the risk allele that impairs this function. It might be that the primary effect is cell-type specific and unrelated to interferon production, and is rather the result of impaired internalization of immune complexes. Since FcγRIIa is present also on the surface of neutrophils, monocytes, macrophages, and platelets, its dysfunction on these cells could yield to the greater amount of circulating ICs. It has also been suggested that FcγRIIa might have dual ability to deliver both activating and inhibiting signals depending on the cell type and the milieu . Another as yet unproven hypothesis suggests that variations in FcγRIIa, FcγRIIb and FcγRIIIa affect risk in a compound heterozygote fashion, and cause disbalance in stimulatory and inhibitory signals . A new function in the TLR9-mediated induction of IFNα genes in pDCs has been recently described for the intracellular form of murine osteopontin 1 (early T-lymphocyte activation protein 1, Eta-1, or SPP1) [110, 111]. The majority of osteopontin 1 is secreted from activated T cells, NK cells and dendritic cells, and plays a key role in bone morphogenesis [112, 113]. Its immune functions include activation of T cells, T-helper type 1 cell differentiation, and activation of B cells and macrophages [114–116]. TLR9 activation by CpG-rich DNA causes rapid association of intracellular osteopontin with the adaptor MyD88 and leads to the induction of interferon genes in an IRF7-dependent manner . Although these data have been obtained from mouse dendritic cells, several lines of evidence suggest the existence of a similar pathway in humans. First, elevated levels of serum osteopontin were detected before and during relapses of different autoimmune diseases, including multiple sclerosis, SLE, RA and inflammatory bowel disease, in humans and their relevant mouse models [117–128]. Second, polymorphisms associated with autoimmunity and high levels of osteopontin were found in both species [119, 129–133]. In mice IRF7 plays a major role in induction of IFNα/β genes in pDCs, while in humans IRF5 is more important than IRF7 - although both factors are able to induce type I interferons [65, 82, 83, 134, 135]. Whether or not human osteopontin 1 is also able to activate IRF5 in human pDCs is unknown at present. Interestingly, polymorphisms located in the 3'-UTR region (rs1126616T and rs9138C) of the human SPP1 gene show much stronger association with SLE in men than in women [136, 137]. The haplotype rs1126616T-rs1126772A-rs9138C, however, is also associated with SLE in general . Moreover, rs9138C is associated with high amounts of serum osteopontin and IFNα in men and young women . Of note, gender-related differences in SPP1 expression were observed also in rats [138, 139]. Bioinformatic analysis of the associated SNPs located in the 3'-UTR suggested that they might disrupt micro-RNA target sites, and thus affect the gene expression . More detailed analysis is required, however, to verify this hypothesis. SNPs located in the 5' region of the gene (rs11730582 and rs28357094) were associated with anti-RNP antibodies in African-Americans, while in European-Americans and Hispanic-Americans only a nonsignificant trend toward association was observed . The study was suggested to be underpowered because of the much lower frequency of individuals carrying anti-RNP antibodies in these two populations. Type I interferons bind to a common ubiquitous receptor composed of the two chains IFNA-R1 and IFNA-R2, coded by two distinct genes located on chromosome 21q22 . The IFNA-R2 subunit is believed to have generally higher affinity to interferons, although it has been reported that various types and subtypes of type I interferon have different affinities and kinetics of binding to the receptor subunits, which may lead to differential downstream signalling . The antiviral activity of interferons correlates with their binding affinities to IFNA-R2, while anti-proliferative activity depends rather on the affinity to IFNA-R1 . Ligand binding causes receptor dimerization and phosphorylation of two associated protein tyrosine kinases, Tyk2 and Jak1, followed by direct activation of multiple redundant signalling pathways. The biological activities of interferons are context specific and depend upon the interferon subtype, the cell type (pDCs, T cells, B cells, NK cells, cytotoxic lymphocytes, other tissue-specific cells), concomitant signals such as cytokines present in the surrounding environment, and activation of other co-receptors (B-cell receptor/T-cell receptor, and so forth). Alternative splicing of IFNA-R2 produces two transmembrane isoforms differing in the cytoplasmic domains, and one soluble isoform may contribute to the differential signalling as well. Three major pathways transmit the signal from IFNA-R: the Jak/STAT, mitogen-activated protein kinase and phosphoinositide 3-kinase pathways (summarized in Figure 2). All of the pathways may overlap to some extent. Downstream signalling results in the induction of hundreds of genes necessary for antiviral defence, which together establish the specific pattern of genes - termed the interferon signature. Pathways activated by type I interferons. Engagement of interferons by interferon receptors activates Jak-signal transducer and activator of transcription (STAT), mitogen-activated protein kinase (MAPK) and phosphoinositide 3-kinase (PI3K) signalling pathways. Jak1-Tyk2-mediated phosphorylation preferentially activates STAT1 and STAT2, which make either homodimers that induce genes with IFNγ-activated site (GAS)-dependent promoters, or heterodimers that bind IRF9 and regulate expression of the genes with interferon-stimulated response elements (ISRE). Other STAT molecules have a more restricted pattern of expression and could be activated by interferons in a cell-specific manner. p38 MAPK is activated in a series of signalling events initiated by IFNα/β and is necessary for induction of genes with both ISRE and GAS-dependent promoters. Type I interferons induce phosphorylation of a number of adaptor proteins, including members of the insulin receptor substrates (IRS1, IRS2, IRS3, and IRS4), growth-factor-receptor-bound protein 2 (GRB2)-associated binding protein 1 and 2 (GAB1 and GAB2) and members of the CRK family (CRKL, and CRK I and CRK II). Phosphorylated CRKL binds through its SH2 domain with STAT5 and activates GAS-dependent genes. Other tyrosine kinase substrates, such as Casitas B-lineage lymphoma (CBL), CBL-b, p130cas and paxillin, also bind to CRKL through the SH2 domain. The guanine-exchange factor C3G interacts with the SH3 domain of CRKL and activates small GTPase RAP 1, which participates in the regulation of cell growth, proliferation and differentiation. Activated IRS adaptors provide binding sites for the p85 regulatory subunit of PI3K, which results in the activation of the catalytic function of the p110 subunit. PI3K is known to activate a number of downstream signalling molecules affecting all aspects of cell biology. Thus, tissue-specific isoforms of protein kinase C (PKC) family, PKCδ, PKCε, PKCθ and PKCη, phosphorylate serine residues in the STAT factors and p38 MAPK. Pharmacological inhibitors that block the activity of distinct PKCs affect the expression of the interferon-responsive genes. The PI3K-AKT signalling cascade mediates survival signals in a cell-type-restricted manner, inducing both anti-apoptopic and pro-apoptotic pathways, and translation of cap-dependent transcripts. Type I interferons activate two members of Src family of kinases, Fyn in T cells and Lyn in B cells. Lyn kinase in its turn phosphorylates B-cell-specific adaptor protein BANK1, facilitating formation of a complex between BANK1, BLK kinase and IP3 receptor 2 (IP3R2). Yellow stars, genes with strong evidence for association with autoimmune diseases; black stars, genes with inconsistent association. ISG, interferon stimulated genes; OAS, 2',5'-oligoadenylate synthase; PKR, protein kinase dsRNA-dependent serine-threonine kinase. The TYK2 gene was reported as associated with SLE in the same study that revealed the association for IRF5 . Unlike IRF5, the first replication attempts where controversial , but to date many more studies have confirmed TYK2 as a susceptibility locus for SLE and it has also been incriminated in multiple sclerosis susceptibility [86, 142, 143]. Furthermore, a recent study in Finnish patients with SLE found significant evidence for interaction between rs2304256 in TYK2 and rs10954213 in IRF5 . No functional polymorphism in TYK2, however, has yet been described. Among the STAT genes, only STAT4 is reported to be associated with several autoimmune disorders in Caucasian populations [144–150], Hispanic populations [146, 151] and Asian populations [152–155]. STAT4 is expressed mainly in T cells, NK cells, activated monocytes and dendritic cells , where it resides in the cytoplasm in its inactive form. Upon cell activation with IL-12, IL-23 or IFNα/β, STAT4 becomes phosphorylated by tyrosine kinases, forms homodimers and translocates into the nucleus, where it induces expression of IFNγ . STAT4 is essential for differentiation of naïve CD4+ T cells into T-helper type 1 cells [158–160]. STAT4 maps to human chromosome 2q32.2 next to STAT1 in a head-to-tail mode with moderate LD between them, which could account for the weak association signal for STAT1 detected in multiple sclerosis  and SLE . STAT3 was recently reported to be associated with Crohn's disease . Currently, the strongest and more replicated association signal within STAT4 is located in the third intron of the gene [144, 147, 148, 152]. We reported an independent association with a haplotype covering the region from exons 6 to 16, which represents the strongest effect within STAT4 for Argentineans and Spanish patients with SLE, while the intron 3 variants have the strongest effect in Italians and Germans . This population-specific haplotype effect was independently confirmed by a study in SLE patients of Hispanic and African-American origin. This study revealed differences in the haplotype structure of STAT4 between populations: the LD between the two associated haplotype blocks (the intron 3 haplotype and the exon 6 to 16 haplotype) is lower in non-European populations compared with European-derived populations . The frequency of this haplotype is much higher in Hispanics compared with Europeans [144, 146]. It has been demonstrated that the intron 3 association is particularly stronger in patients with anti-dsDNA autoantibodies, nephritis and early disease onset [148, 152, 163]. The reported allelic heterogeneity of STAT4 might thus either be reflecting true population differences or these two haplotypes could be important in different clinical and/or serological subsets of patients. The STAT4 haplotype risk correlates with higher levels of STAT4 expression, which seems to be cell specific [144, 148]. Besides, the tissue-specific alternative promoters identified for STAT4 suggest a more complex regulation of the gene, which poses an additional obstacle in the search for the causative variants and their effects. One recent study reported a striking correlation between the risk allele of SNP rs7574865 and increased expression of interferon-induced genes in the absence of high amounts of interferon . This increased expression may lead to a lower threshold for disease initiation. Moreover, the disease-associated alleles for IRF5 and STAT4 variants have an additive effect on the risk for SLE [144, 148]. Interestingly, STAT4 expression - unlike any other STAT genes - is restricted mainly to T cells and NK cells, and in this respect it is reminiscent of the very limited expression pattern for IRF5 . Further re-sequencing of STAT4 might be necessary in order to identify the true functional variants. Although some genes and their products may not directly participate in the signalling from the interferon type I receptors, they still may be regulated by interferons and comprise a large group of genes included in the interferon signature pattern. We will focus on two genes/proteins modulated by type I interferon, Src-family tyrosine kinase BLK and adaptor protein BANK1, because they are confirmed SLE susceptibility loci as identified by genome-wide association studies, both are specific for B cells and their expression in B cells is modulated by type I interferons [145, 166]. To date, the association of BLK with SLE has been replicated in European , Japanese  and Chinese  populations, and it has also been implicated in RA  and primary anti-phospholipid syndrome . The risk allele of the SNP rs13277113, located in the promoter region of BLK, is negatively correlated with the levels of BLK. It has also been shown that treatment with IFNα rapidly downregulates expression of BLK and, moreover, its expression is negatively regulated by infection with Epstein-Barr virus, which has been suggested as one of the environmental triggers for autoimmune diseases . Low levels of BLK, determined by the risk allele, exposure to high amounts of interferon, and infection with Epstein-Barr virus altogether might therefore exert a cumulative effect on risk through negative regulation of BLK in B cells. BANK1 association was identified in Scandinavian patients with SLE  and further replicated in European Americans [86, 149, 171] and Chinese populations . It has also been incriminated in RA, although with a less strong effect size . Three disease-associated variants have been described: rs10516487 (R61H) located in exon 2; rs17266594, which is in strong LD with rs10516487 (r2 = 0.90) and is located in intron 2, where it alters the branchpoint site; and an independent signal in exon 7 coding for an ankyrin domain (rs3733197, A383T) . The variation at the branch-point site alters the efficiency of splicing of exon 2. The risk allele of rs17266594 correlates with high levels of the full-length isoform and low levels of the alternative isoform lacking the entire exon 2, which codes for a putative binding domain for inositol 1,4,5-triphosphate receptor type 2 (IP3R2), known to associate with BANK1 upon B-cell activation . We have observed that polymorphisms of BANK1, BLK and ITPR2 genes display statistical genetic interaction, increasing substantially the risk to develop SLE (Castillejo-Lopez C, Delgado-Vega AM, Wojcik J, et al., submitted data) . Interestingly, LYN - another B-cell-specific tyrosine kinase recently associated with SLE [85, 176] - may activate BANK1 through phosphorylation, leading to further stimulation of its interaction with IP3R2. Reduced levels of LYN were also detected in B cells of lupus patients . Of note, expression of BANK1 in B cells is upregulated by type I interferons and, together with decreased levels of either of the kinases LYN or BLK, may significantly distort the signalling and lead to increased production of autoantibodies - although the precise role for the adaptor protein BANK1 in B cells is awaiting elucidation. Autoimmune diseases are caused by the breakdown of self-tolerance and are characterized by persistent activation of immune cells, leading to histopathological damage in the absence of an ongoing infection or other discernible cause . These diseases have complex genetic heritability with many genes giving modest contributions to the disease initiation and perpetuation. Given the role of type I interferons in autoimmunity, the associated genetic variants that have been reviewed in the present article are believed to lead either to the excessive production of interferons and further amplification of the deleterious interferon-mediated signalling, or to impaired negative regulation of the interferon pathways, or to abnormal response to interferons caused by the increased sensitivity of cells. Remarkably, the most strongly associated genes, such as IRF5 and STAT4, are not only replicated in many populations, but also predispose to various autoimmune diseases. On the other hand, genes with weaker signals are rather associated with specific clinical manifestations; that is, they affect only specific subsets of patients with particular disease, and as such may be considered disease modifiers rather than true susceptibility genes. Based on the two most studied examples - IRF5 and STAT4 - it is tempting to speculate that common shared genes are located in the major knots of the signalling cascades. The current lack of data on association of a particular gene, already found to be associated with a specific disease, with other autoimmune diseases, however, does not mean a lack of association per se. Given the generally low prevalence of autoimmune diseases, it is often a challenging task to collect a large enough number of patients with another autoimmune disease from the same population. It is possible also that complex epistatic interactions hinder genetic associations, and thus will require more detailed analysis of an individual's genotypes for various genes. Another complication was recently highlighted by the finding that rare mutations or copy number variations may lead to the development of autoimmune diseases. Rare nonsense mutations have been detected in the DNASE1 gene in two Japanese SLE patients . A number of rare mutations associated with SLE and Sjogren's syndrome were identified recently for another nuclease, TREX1 [180, 181]. Likewise, protection against type 1 diabetes was associated with four rare variants in the IFIH1 gene . This highlights the challenge of gene re-sequencing and the importance of projects like the 1000 genomes  in order to find noncommon variants with highly penetrant effects in autoimmune diseases. Despite the fact that interferons are linked to many diseases, the exact role of different types of interferons in various autoimmune diseases may be different, or even opposite. While treatment with recombinant interferons is known to ameliorate multiple sclerosis, it triggers the development of SLE, type 1 diabetes, psoriasis, inflammatory arthritis and pSS [39, 40]. The genes and alleles associated with distinct diseases in connection with interferon-mediated pathways could therefore obviously be different. The present project was supported in part by the Clas Groschinskys foundation, the Swedish Association Against Rheumatism to SVK and MEA-R, the Torsten and Ragnar Söderbergs Foundation, the Swedish Research Council, and the Gustaf Vth, 80th Jubilee to MEA-R. The authors would like to acknowledge also the support from National Institutes of Health grants RR020143, AI083194, CA141700 and AR058621 to MEA-R.